Wearing a helmet is not necessary under UK law, however it is advisable to do so as helmets have been shown to reduce head injuries in impact related crashes. A helmet must fit you snugly, covering as much of your temples as possible. 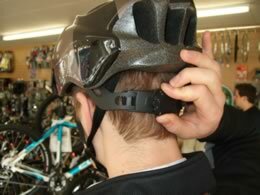 It is best to buy a helmet from a bike shop and get their advice on fit. Get a model with good ventilation, keep it in good condition, and replace it if it gets damaged. All helmets have adjustable straps, most helmets have an adjustment to the rear of the helmet. By turning the dial it will tighten the helmet on your head. Gloves: Wearing gloves while riding keeps the windchill on your hands at bay, and also offers protection for your hands should you fall off the bike. Gloves come in two basic styles – full finger and half finger (sometimes called mitts). 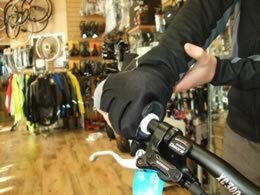 Full finger gloves are best in colder weather and where more protection may be needed, for example in mountain biking. Front and rear lights must be used at night or in poor visibilty. In 2005 the law changed to allow riders to use flashing rear lights. Not only do flashing rear lights attract more attention they are on average 3 or 4 times more visible. Lights are available with standard bulbs, LED (light emitting diodes) or high powered bulbs using halogen or xenon. Most LED’s are very bright, last a long time and have a high battery life, they are ideal for rear lights. If you use your bike a lot in the dark or winter you can upgrade your lights to a high powered set and you can run them from a dynamo or rechargable batteries. It is absolutely essential to ensure you wear bright clothing whilst out on your bike. Modern cycling clothing is packed with reflectives.